How Much Will It Cost To Fix My Dent With Paintless Dent Repair? https://www.concoursautosalon.com/wp-content/uploads/dent-repair.jpg 285 685 Ron Harris https://www.concoursautosalon.com/wp-content/uploads/Website-Header.png Ron Harris2015-11-02 06:52:302015-11-03 05:30:44How Much Will It Cost To Fix My Dent With Paintless Dent Repair? Concours Auto Salon is your best option for removing dents, creases, dings, and hail damage on your vehicle. With Our paintless removal process in San Antonio you will preserve the factory finish of your vehicle paint. Nowadays saving money is very important and with our PDR process, you pay less money than on a conventional body shop repair. Time is very important, especially when you are going to leave your car for a repair. Paintless dent repair of minor dents and dings takes 1-3 hours; these repairs take 4-6 days at a conventional body shop. Hail damage repair using PDR takes 1-3 days; while this takes 2-4 weeks on average for conventional body shop repair. Time is money and saving time on the repairs also saves you money. We offer same day service on most small repairs. You avoid the hassle of being without your car for weeks or long waits at the body shop. CUSTOMER SATISFACTION IS OUR NUMBER ONE PRIORITY! We want your experience with us to be the best you’ve ever had and we’ll do everything possible to restore your vehicle to its factory finish! Concours Auto Salon, LLC was established in 2008. Ron Harris, our PDR professional and has over 15 years experience as a PDR technician. Ron is a highly skilled PDR technician who has had extensive training, experience and is a Vale Certified Paintless Dent Repair Master Craftsman. 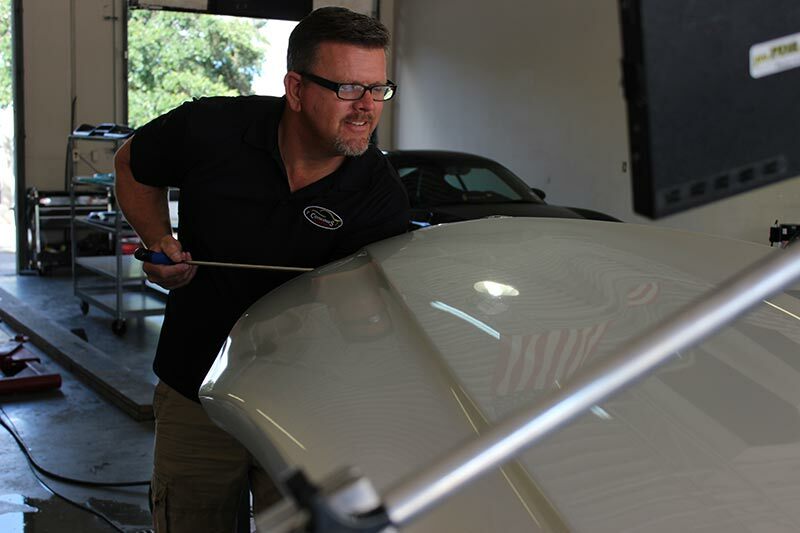 He has performed paintless dent removal on almost every make and model imaginable. Give us a call or stop by the shop for a free estimate. Restore your vehicle to its original factory condition following the recent hail storm in San Antonio with hail damage repair by Concours Auto Salon. We specialize in repairing vehicles that have been struck by hail. If your vehicle has been damaged by hail, you can rest assured that Concours Auto Salon has the experience and technology to get your vehicle back to its pre-damaged condition. Your first move should be to contact your insurance company to start the claims process. Many people are hesitant to file a claim for fear of their insurance premiums being raised. Hail damage is covered under your comprehensive coverage and is considered an act of nature. Filing a hail claim will never cause your premiums to go up, regardless of what anyone tells you. We normally enjoy writing independent estimates for customers but during these very busy weeks after the hail storm we have limited time. However, we will work from your insurance carrier’s estimate. If there is any discrepancy in their claim, we can handle it with them directly to ensure your vehicle is repaired back to pre-damage condition. You are welcome to make an appointment to leave your car with us. We will meet with the adjusters at our shop, assess the damage with them and start the repairs immediately after the assessment. This process will save you the most time and get your vehicle back on the road faster. When a hail storm hits San Antonio, avoiding the damage is nearly impossible. But repairing the hail damage is quick and easy with Concours Auto Salon’s hail damage repair process. Choosing the right company to perform repairs to your car can be difficult at times. Do an internet search for dent repair and you find several companies that look reputable. They may even have great reviews. The truth is people can manipulate the internet and make any one look like a legitimate company. Were going to share some pictures and a story with you about a woman who was taken advantage of by a company posing as a PDR (paintless dent removal) company on the internet. The pictures below are what this companies finished repaired looked like. Really a terrible job. When it came time for this person to get paid they slathered a bunch of wax on the paint. This is an old scam that people do and still get away with today. The wax hides some of the imperfections (we don’t know how it was so bad) then the customer is told to remove the wax after a couple of days and the repair will look as goos as new. Ok so now you can see what bad workmanship this guy has. Not to mention bad ethics. He even gave this woman a hand written receipt with two contact phone numbers and a 90 day warranty. Yes she did try and contact him. Guess what He didn’t return her calls. Her next search was to find a company that was in a fixed location like our shop. Someone she could go back to if there was ever a problem. She did a search for “certified paintless dent removal san antonio” and we came up in her search. After meeting with us she felt comfortable leaving her car for a re-repair. She was informed that it wouldn’t be perfect repair and that if we couldn’t repair it to her satisfaction that there would be no charge for the effort. The previous repair was so botched that the metal was stretched, the paint was cracks in some areas and you could see marks where the others persons tool slipped. For more information about paintless dent repair by our certified technician give a call or stop by the shop. DRP’s What is this and what should I know about them. Below is an article published on the Vehicle Information Services website. It’s a really good read and should be mandatory if your vehicle is in a collision or has been damaged by a hail storm. Direct Repair Programs and Repair Guarantees: Steering In Disguise? If you have recently been involved in a motor vehicle accident, you may have discussed which repair facility will be fixing your car with either your own insurer or with the insurer of the person who caused the accident. Most people are, thankfully, involved in collisions so infrequently that they do not have a repair facility immediately in mind when it does happen. When there is an accident, however, be careful where you do take the car to be fixed. Simply because an insurer recommends a shop or says that it will “guarantee the work” from a shop in its direct repair program does not mean you will be receiving the best repair. What are direct repair programs? A direct repair program, or “DRP” as they are often called, is an automobile insurer’s group of preferred repair shops. Think of a DRP like a health insurer’s circle of preferred provider organizations. Body shops involved in an insurer’s program have a relationship with the insurer. That relationship, however, can be based on many different things, not all of which are good for consumers. Direct repair programs promote the insurers’ best interests, not the consumers’. DRP arrangements are initiated by insurers, not body shops, and insurers have their own reasons for desiring to create these circles. To become a member of an insurer’s repair program, repair facilities typically must execute an “agreement” with the insurer. However, this agreement spells out obligations on the part of the repair facility but usually does not contain any reciprocal obligations on the part of the insurer. Some of the key standard provisions require the repairer to write all estimates using aftermarket (non-original equipment manufacturer) or salvage parts; identify “betterment” to a repaired vehicle and collect those monies from the customer; shoulder all liability for repairs performed; and indemnify the insurer from any lawsuit the customer might bring. In other words, the body shop is entirely responsible for any customer dissatisfaction. In exchange, the repairer receives what exactly? According to the terms of these “agreements”, the insurer promises the repairer nothing in return for all of the obligations it will undertake. The repairers usually do not even have the right to advertise that they are part of the insurer’s direct repair program. For example, State Farm’s Service First Agreement expressly prohibits repairers from using either State Farm’s name or its Service First designation without “express written permission from State Farm” . . . which must be “in the form of a Licensing Agreement, to be executed separately from this Agreement”. (State Farm Service First Agreement, paragraph 9.) However, this same paragraph expressly allows, but does not require, State Farm to advertise to its customers that the repair facility is a member of its direct repair program. The obvious question raised is: Why would any repairer sign up to be a member of these programs when the insurer has no overt obligation to do anything on behalf of the repair facility? The only sensible answer is that the repairer believes becoming a member of the DRP will drive more work to its shop. And therein lies the rub. Some state laws prohibit insurers from forcing consumers to have their cars repaired at particular body shops. Engaging in that conduct is called “steering”, and there are anti-steering statutes to prevent insurers from removing free choice and free enterprise from customers of the repair industry. Nonetheless, while insurers are quick to say that they do not require claimants to patronize particular shops, they do strongly recommend the use of repair facilities within their provider programs. Claimants are frequently told that, while they are free to select any shop of their choosing, the insurer will only “guarantee” the repair work of a DRP facility. The insurer’s “guarantee” is material to most claimants and has the effect of steering their work to DRP facilities and away from independent shops. So, whether the insurer insists you take your vehicle to a particular shop or lures you there with guarantee promises that sound as if you will get more than taking your car elsewhere, the end result is the same. You elected a shop which has pre-negotiated with the insurer to repair your car using generic or salvage parts, is required to identify and charge you for purported increases in value to your car, and has promised to insulate the insurer from liability for the work performed. Insurers are not actually guaranteeing repair work. Although claimants are told the insurer will be “guaranteeing” the repair work, the insurer does not actually guarantee that work. Instead, under these DRP arrangements, the shop is required to perform that repair in a workmanlike manner – which state common law already requires of all repair facilities, irrespective of whether they are DRP shops, and it is the shop, not the insurer, who guarantees the work. Insurers do not guarantee that the method of repair is safe, nor do they guarantee how the repair is performed. The only aspect of the repair that the insurer actually “guarantees” is limited to the parts used – and then it only covers the generic ones. Under DRP arrangements insurers require repair facilities to write estimates using aftermarket and salvage parts. Parts made by the original equipment manufacturer (OEM) are excluded from the promises insurers make about the repair. Yet, even these generic parts are not fully covered in the guarantee. Reviewing estimates and documents from several insurers demonstrates that some guarantee only the fit and corrosion resistance of the replacement part, not its performance. Others guarantee the performance of the part, but only after the claimant has exhausted attempts to have the manufacturer repair or replace the part under its own warranty. Makers of aftermarket parts are typically located in Asia and enforcement of a warranty is extremely difficult as a result. This was one of the primary issues in the aftermarket parts case, Avery v. State Farm Mutual Automobile Insurance Company, 321 Ill. App.3d 269, 254 Ill. Dec. 194, 746 N.E.2d 1242 (2001), appeal allowed, 201 Ill.2d 560, 271 Ill. Dec. 922, 786 N.E.2d 180 (2002), in which State Farm was found to have breached its insurance contracts with policy holders by guaranteeing replacement parts and later refusing to honor the guarantee until after the customers exhausted their warranty rights with the manufacturer. In the appellate decision, the Avery court found State Farm’s promise to repair or replace these parts was illusory. Look warily at any insurer’s recommendation of a repair facility because the insurer is pushing you toward certain shops for its benefit, not necessarily yours. Ask the body shop if it is a member of the insurer’s direct repair program and, if so, to provide you with a copy of the document establishing that relationship and outlining the repairer’s obligations to the insurer. Remember, you are the customer in this repair contract and you are entitled to a proper repair from the shop you elect. If any shop balks at showing you the agreement it signed with the insurer, insist on obtaining a copy from the shop or the insurer directly. If neither party will produce a copy of the agreement for your records, take your vehicle to a different shop. After all, if this arrangement is really such a great thing for consumers, no party to it should have any concerns about showing it proudly to customers. https://www.concoursautosalon.com/wp-content/uploads/Website-Header.png 0 0 Ron Harris https://www.concoursautosalon.com/wp-content/uploads/Website-Header.png Ron Harris2013-09-17 09:10:092013-09-26 14:25:52DRP's What is this and what should I know about them. Recently a local San Antonio resident contacted us through our Facebook page inquiring about a dent they needed repaired using our paintless dent repair method. He sent us a picture of the dented panel that was the drivers side rear door. We informed him that the damage might not be reparable due to the location of the dent. If a car door is dented at the very top, damaging the body line, it can be challenging just to get our tools up there. You see there is an upper brace inside the door. This gives the door rigidity so that it wont flex and bend. This brace sits really close to the outer door skin 1/8th of an inch or less and usually has some type of glue or sealant bonding it to the panel. Below is one of the pictures the customer supplied us through Facebook. Looking at the above photo you can see the dent. What you don’t see is the attempt another PDR (paintless dent repair) company made to try and repair the dent. Below the dent the metal is pushed out and there were small bumps poking out. This was going to make the repair even more challenging. The picture above shows the body line pushed in and a crown on the top of the door. You can now see some of the outward dent left behind from another PDR companies attempt to repair the dent. We used special thin tools. Or as we call them shaved tools, to go between the brace and the outer skin of the door. The tools were inserted through an electrical boot on at the front of the inside of the door. To remove the high spots we used a special blending hammer and plastic knockdowns Special care is given to not damage the paint. The finished repair. No Dent! The repair time for this dent was close to two hours. The body shop would have taken 3 days or longer. We saved the customer time and a lot of money. All dent repair are polished when finished leaving behind no signs of the repair even being done. If you or a friend needs paintless dent repair give a call. It doesn’t cost a thing for the estimate. Let us see if we can save you time and money. If you own a classic car chances are your not going to get a parking lot ding any time soon. However tools falling on fenders bikes bumping into it while its in the garage or thing falling off shelfs are common stories we’ve been told. When I first learned PDR (Paintless Dent Repair) I was told that metal on cars from 1980 and older was to thick and strong to be effectively repaired with this process. This statement might hold true for large, complex and deep dents but for your average door ding they couldn’t be more wrong. When it comes to Classic Cars, restored Classics and Hot Rods there are a few things that can make a ding or small dent Unrepairable with PDR. Paint Condition Old and custom color paints tend to be softer then more modern two component paints. Often times paint is single stage and can easily get divots when knocking down a crown or a high spot from the panel. Great care is taken ti ensure that this doesn’t happen These paints are susceptible to cracking as well. We will use heat to warm the paint, making it more flexible if the paint is old or it’s age is unknown. Previous Body Work Almost all restored classics and hot rods have had body filler used on them. Most car owners have no idea where the filler is. When we start a repair we don’t start pushing hard right away. We test the panel with light pushes. Testing it to see how the metal is reacting and if out tool tip is easily detected from the outside. If there is body filler where the dent is we probably cant repair it with PDR. Recently we had the opportunity to work on this 1965 Mustang GT350H. The owner drives it daily and had aquired a few dings in the side panels. As you can see there is a ding visible in the white light and an outward dent (probably caused by something in the trunk sliding around) in the yellow light. The ding was massaged with special tools for PDR from the back side of the panel. The outward dent was knocked down using a plastic tapper and light weight hammer. This is the panel with the repair completed. This is the front fender with a nice size ding. This is the finished repair. No dent visible at all. The paint was not damaged and received a light polish after the repair was finished. At Concours Auto Salon we take great pride in our work. Extra special care is given when we have the opportunity to work on American Classic Cars like this one. Old car or new on we would love to repair dents for you. Recently we had a new customer in the shop for a specialized service we offer. It’s called Paintless Dent Repair or (PDR) His Lincoln MKZ was hit on the passenger side rear door. The video shows you what is possible with the paintless dent repair method when its performed by a skilled craftsman. PDR is some what of an art form. It’s done at our shop on a daily basis as well as all over San Antonio by a select few who understand this art form. Small pea size dings to large complex dents as well as cars that have hundreds of dings from recent hail storms. If your car has a dent and you think it’s a candidate for paintless dent repair give us a call or stop by the shop for your free estimate. The recent hail storm here in San Antonio has made thing really busy at Concours Auto Salon. Customers have been coming in daily, getting estimates and scheduling to have their vehicles hail damage repaired with the paintless dent repair process. 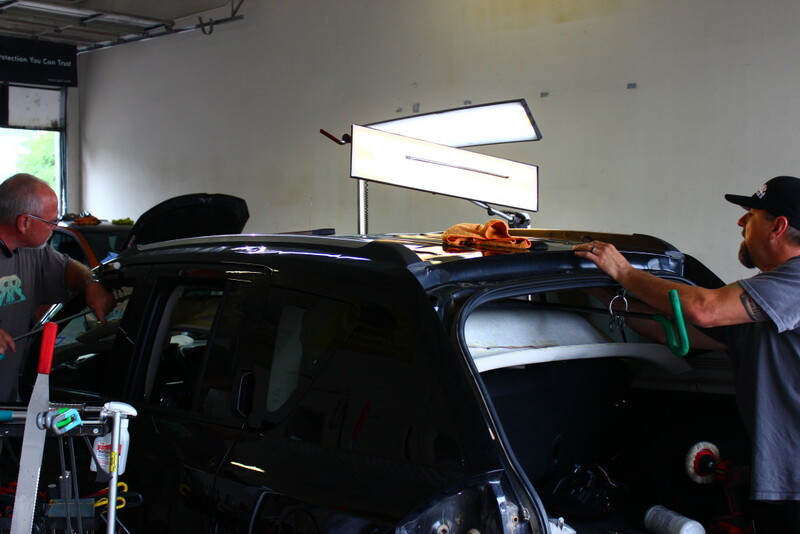 The Vale Certified paintless dent repair techs at the auto salon are saving hoods roofs and trunk lids that insurance companies wanted to scrap and replace. Paintless Dent Repair or (PDR) is an industry repair process that involves the removal of hail dents or other types of damage from a vehicles exterior with out damaging the painted finish. surface imperfections. Damage is also repaired by bonding a tab to the exterior of the panel and pulling the dent from the top side. This is called glue pulling. Both process are used to restore panels to their original condition thus eliminating the need to refinish the panel. If you or someone you know has a door ding or dents from recent hail storms stop by our shop for a free estimate and a demonstration. Were always ready to answer questions and assist in any way.